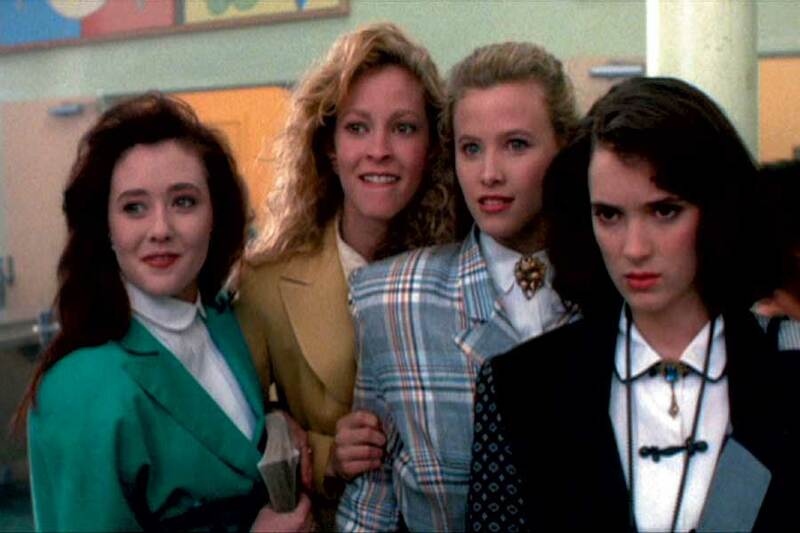 “F*ck me gently with a chainsaw”…a review of the cult classic “Heathers” | stabs in the dark. In the shadow of recent events occurring over the past 8 months and the drunken swamp I have slithered into, I have decided to crawl out and start tapping the keys again. The topic: a reviewing of one my favorite dark comedies I watched quite a bit during my childhood, “Heathers“. So dark a symphony that director Michael Lehmann and writer Daniel Waters orchestrate. As I view the director’s track record, i am impressed with every scroll; “Dexter“, “The Larry Sanders Show“, “Bored To Death“, “American Horror Story“, “Californication“, and “True Blood“, just to name a few. So, with a shaved head and a semi-fresh outlook on life, I am going to dive right into this review and invite you to ride along (don’t forget your chainsaw grease). “Heathers” is a 1988 dark comedy that burrowed its little self behind my eager 9 year old eyes. The film stars Wynona Ryder (Beetlejuice, Edward Scissorhands) as Veronica, the black sheep and one-fourth of a clique known as the “Heathers”. She falls in love with outsider, JD (Christian Slater – Pump up the Volume, True Romance) and they begin a destructive “Bonnie and Clyde“-esque relationship chock full of murder and betrayal. Shannen Doherty (Beverly Hills 90210, Mallrats) rounds out the cast as one of the “Heathers”. I don’t want to give away too much plot in the certain case some readers have not seen the movie. Which leads me right into the entire point of this article that also doubly serves as a therapeutic brain massage. On Friday night, May 17, 2013, at the Naro on Colley Avenue starting at 9:15pm, AltDaily will be showing the cult gem, “Heathers”. Since AltDaily is behind this event, you know there will be special surprises in store for the audience and of course, alcoholic concessions. Please click here for the facebook event and more info. Posted by belchdini on May 14, 2013 in Comedy, Dark Comedy, Dark Humor, entertainment, film, FILM BLOG, movies, television and tagged altdaily, american horror story, beetlejuice, belcher, beverly hills 90210, christian slater, christopher, cult classic, DEXTER, edward scissorhands, heathers, Kevin smith, mallrats, naro, norfolk, pump up the volume, quentin tarentino, review, shannen doherty, tim burton, true blood, true romance, va, wynona ryder. Glad to read that you crawled out the drunken swamp you mentioned. I’ve been checking out this site every so often for new posts and glad to see one. I like Heathers too. I must have loved the movie more than I thought. Just realised I can still remember even twenty years later bits and pieces of it, like one of the girls putting another’s outfit down with ‘Oh, that’s sooo 87!’, and horny jocks, one who said ‘I just wanna get laid’, another who wonders if he can write his experience to Penthouse, cow tipping, something about a rumour of a ‘swordfight’ in Veronica, etc etc. Would love to watch it again if I can find it!